Homemade Pizza! | What Am I Eating? When did pizza turn into a greasy pile of cheese, soggy dough and too many low-quality toppings? Such a beautiful concept turned ugly by millions of crappy restaurants and cheap chains. Trader Joe’s to the rescue! Wandering through the aisles, I spotted gooey balls of whole wheat pizza dough. I couldn’t help but put a couple in my cart, along with a bag of arugula, some heirloom grape tomatoes, a log of mozzarella and a bottle of olive oil. I love planning dinner this way. I don’t need a recipe or website for help, just the inspiration of fresh and inviting ingredients. Okay, maybe I cheated a bit. I can make pizza dough, and better pizza dough than they sell in stores. But, I try to avoid my nemesis (flour) at home where no dishwasher (human!) awaits to sweep up my mess. Pathetic, yes. Lazy, definitely. But, after a day of cooking for other people, sometimes I need a shortcut. At least this shortcut includes whole wheat flour! Healthier, and tastier. My first attempt did not turn out the way I planned. Do not attempt new recipes while starving! I sprinkled cornmeal on my baking sheet, but did not grease the pan, or line it with anything. Stupid, stupid, stupid! The smell of garlic and roasting tomatoes wafted through my apartment as I attempted to scrape the pizza off the baking sheet with a spatula. I succeeded, partially. The crispy part of the crust remains stuck to the pan, and the pan still sits in the sink taunting me. “Do not even attempt to clean me! Only failure awaits you!” The top of the pizza tasted wonderful, but did not include the contrast of a crispy crust. My next try included lining the baking sheet with foil, and greasing it liberally with pan spray. The result: a perfectly crispy crust topped with sweet roasted tomatoes, melting mozzarella with just enough of a caramelized crunch, and pungent arugula for a fresh contrast. So good I ate it three days in a row. Freshly made each time, of course. Preheat the oven to 450 degrees F. Line a baking sheet with foil, spray generously with pan spray, and sprinkle with 1 tbsp of cornmeal. Heat the pan in the oven while you assemble the pizza. This will help crisp the crust. Meanwhile, sprinkle a cutting board with flour and roll out the pizza dough to a quarter inch thickness. Make sure the dough does not stick to the cutting board. Add more flour if necessary. You can also divide the dough in half and make two individual pizzas. Brush the dough with 1 tsp of olive oil and sprinkle with the minced garlic. Top with the sliced mozzarella and the halved tomatoes. Sprinkle with salt and pepper. Remove the preheated baking sheet from the oven, and carefully slide the pizza on it. Put the baking sheet in the oven, and bake for 20 to 25 minutes, until the crust is golden brown. Let the pizza cool for a couple of minutes. Meanwhile, toss the arugula with 1 tsp of olive oil and salt and pepper. 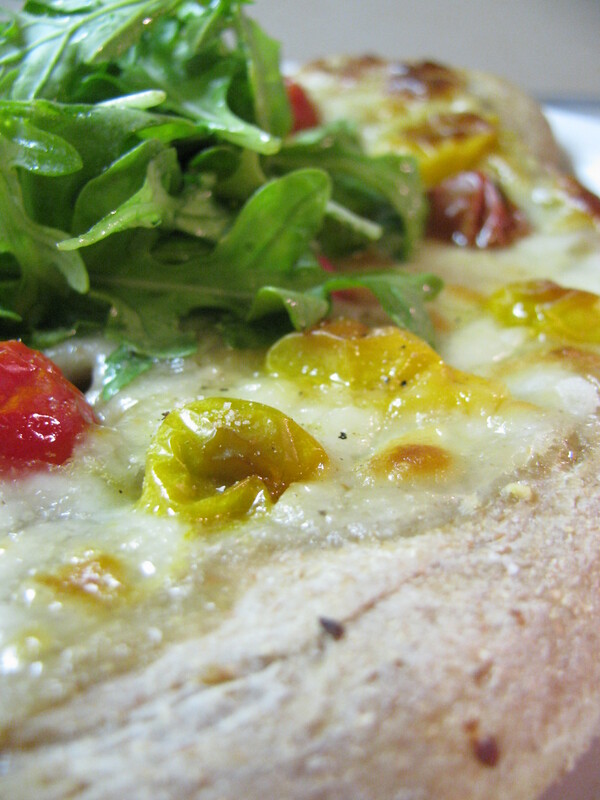 Top the pizza with the arugula, slice the pizza and serve. That looks delicious. I often plan meals/recipes based on what looks pretty in the vegetable section of the store. I wonder if English supermarkets sell pizza dough – I’ll check it out.